This is true especially if you work from home, or have your own small business. Must read: The types of things you need to shred. The bulk of the shredding takes place in Jim’s office, so he has a heavy-duty cross cut shredder from Fellows. After looking at all of the shredders available at the office supply stores and department stores around Nashville, I am very happy with our decision to stick with Fellows shredders. The others I saw in stores had awkwardly shaped (or heavy) lids that had to be removed each time you wanted to empty them. Or they were just massively large and heavy units themselves. We didn’t need an industrial strength commercial shredder, yet the “good” ones seemed to be like that. So we settled on a brand we were already familiar with: Fellows. In fact, Jim’s hand-me-down Fellows shredder is over 15 years old and still works like new. Except for the long paper strips — that sometimes get backed up when the bin needs emptied — there is absolutely nothing wrong with this trusty ‘ol shredder of ours! A crosscut shredder (because it’s more secure). The ability to shred more pages at once (this one does 12 pages; the old one did 3 pages at a time). One that was easier to empty (with the old one, you have to unplug the AC power cord and then remove the lid from the top of the unit each time). The ability to shred credit cards and CDs was a bonus (though he does use that more than he thought it would; I used to cut them up with scissors all the time). 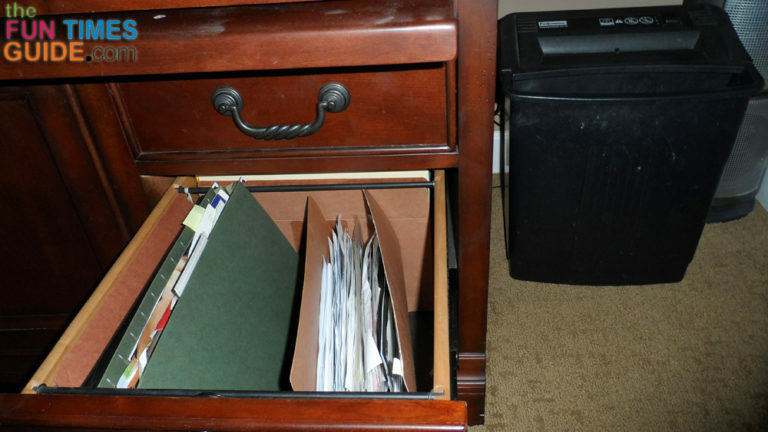 As seen in the photo above, all of those cross-cut pieces of paper can cause a small mess when you pull out the drawer to empty the paper bin. The reason: the paper bin isn’t quite as large as you’d think. Therefore, when it’s about half-full, you need to empty it. Otherwise, the small bits of paper will spill over the sides as you pull the bin out of the shredder to empty it. Not a huge deal, but a deal nonetheless. Don’t Forget The Shredder Oil! And finally, no matter what shredder you decide to go with, don’t forget the shredder oil! It’s actually a cinch to use shredder oil: just squirt a line of oil on a sheet of paper and feed it into the shredder.